Find out how the other teams train, and see files from the 2018 Tour de France here! Pro tour riders all have specific strengths that make them an asset to their team. Whether they’re known for being sprinters, time trialists, general classification riders (GC) or climbers, they all have areas where they shine. While all of these phenotypes come with their own unique skill sets, it’s often the classic climbs of the Tour de France that capture the audience’s attention and imagination. Let’s look more closely at what classifies a climber on the Tour, and how mere mortals might train to be stronger when things tilt skyward. What’s the difference between a rider built for climbing and those who focus on other disciplines? First and foremost, great climbers have a high strength to weight ratio (W/Kg). They’re often able to hold 5-6 W/Kg on climbs lasting several kilometers at very steep grades. They accomplish this by maintaining a lean and light body type while still being able to put out high power for longer durations. This gives them an advantage over sprinters and time trialists who may be bigger riders, or not able to maintain power for as long as it’s needed in the mountains. Typically these climbing specialists also have a very high VO2 Max. These genetically gifted riders produce VO2’s in the 70-90 ml/min/Kg range determining their high aerobic capacity and ability to produce energy aerobically. High W/Kg, genetically gifted VO2 Max and the right body type make these athletes ideal for the high mountains of the Tour. Just like the pro riders, any rider hoping to get faster on hills should focus should on watts per kilogram. When the terrain begins to go upward, W/Kg is what matters most. The two most productive things an athlete can do to be prepared for climbing is to find their ideal body weight, and increase their power. This will yield a maximum strength to weight ratio. Other key areas should be developing your body’s lactate clearing potential, aerobic and anaerobic capacity, muscular strength, and threshold. This can be accomplished by executing workouts that prepare the body for the rigors of climbing. Integrate increasingly longer efforts at or just below FTP to encourage aerobic and muscular gains. Also include shorter efforts above threshold to train the body to efficiently use anaerobic sources of energy. Climbing, like any other bike skill, can be learned and developed over time with consistent and proper focus. The massive climbs of Europe are what help make the Tour de France what it is. They push riders to their physical and mental limits by asking the absolute most from each athlete. 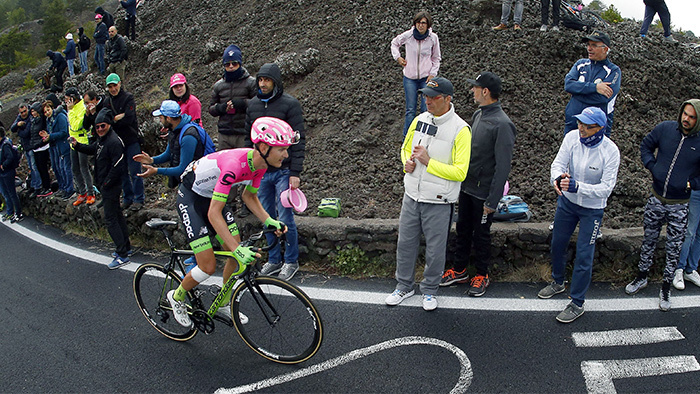 Climbing specialists in the pro peloton have developed the power necessary, along with the ideal body type and natural ability, to conquer these climbs. While most athletes aren’t pro tour riders, every cyclist can focus on being a more confident and proficient climber—regardless of their genetic predisposition. Get advanced training insights tailored to your unique physiology with WKO4 and learn to climb mountains like a pro. During the Tour de France only, download WKO4 for only $99. Use coupon code tdfwko at checkout.